October 21, 2014, 2:34 PM · How do modern violins compare to the best Strads, when played side-by-side? 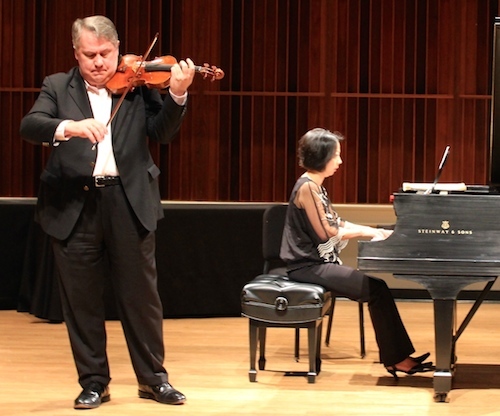 One of the most memorable events in Indianapolis last month was when violinists Phillip Setzer and Cho-Liang Lin took time from their duties as jurists at the International Violin Competition of Indianapolis to perform on Stradivari violins and great moderns, including prize-winning moderns from the Violin Society of America's instrument contest, which took place at the same time. Not only that, but violin maker Joseph Curtin and researcher Claudia Fritz, known for their experiments with modern and old instruments, provided context by presenting some of their thoughts and findings during this event, called "Violin Quality and the Paris Experiment," which was as much a concert as a lecture on Sept. 20 at the Indiana History Center. Phillip Setzer started by performing his own arrangement of the Schubert Song, Du Bist die Ruh, first on the 1714 "Jackson" Strad, then on Setzer's own violin made by Sam Zygmuntowicz, which was based on the Jackson. He played with pianist Chih-Yi Chen. Frankly I was distracted from the task at hand (trying to discern the difference between the instruments) by Setzer's gorgeous playing. Across the board was his sound, intimate and personal in the beginning, and then flowering and growing through the piece. And what a beautiful vibrato, with such loose fingers! In this case, I couldn't help but think, for the audience, the player makes the music. For the violinist, the instrument is the partner, and an artist's opinion about the instrument has to be connected to whether or not it easily makes the music as he wants it. He may have to try harder to produce his voice and his interpretation with one than the other, but the audience may not discern this when the artist is such a fine one. Following Setzer's performance, Curtin talked about the myths and beliefs surrounding old vs. new violins. "Stradivari and Guarneri del Gésu are, for me, the greatest makers we've known yet," Curtin said. But their legacy of excellence sometimes causes modern violin makers to live under a kind of paternal cloud, hindered by the feeling of a "varnished spruce ceiling" of violin making. "It can paralyze a young maker." 1. Violins improve with playing; the longer and better they are played, the more they improve. 2. Any competent violinist can separate old from new violins by playing them. 3. The best old Italians are quiet under the ear but out-project seemingly louder new instruments in the hall. 4. Strads and del Gésus have distinct voices. 5. The sound of the best old Italians have never been reproduced in newer violins. These beliefs have evolved over time, and "we rely on what great violinists from the past have said," Curtin said. But are they true? "Scientists don't believe or disbelieve, they just want to test this." What do recent "ear-witness" accounts suggest? Curtin and French National Centre for Scientific Research researcher Claudia Fritz led the controversial 2010 double-blind study that was held in conjunction with the previous Indianapolis competition. "We agreed there were limits to the study -- it was the first one we did, and we had to learn from it," Fritz said. Curtin and Fritz took the results and the criticisms, and they devised a new study, to be done in a concert hall with top players and more instruments. The "Paris experiment," as they called it took place in 2012 at two locations on the outskirts of Paris, France, with 12 violins, six old and six new; and 10 soloists with international careers. There were two sessions, an hour and fifteen minutes each, and participants were allowed to use their own bows. They played in a small rehearsal hall, then in a 300-seat hall, with reduced lighting and wearing welding glasses. In the concert hall, they were allowed the feedback of one friend, and they were permitted to have the violins played for them, so they could hear them from a distance, not just under the chin. Their task: to choose a violin for a hypothetical solo tour, next week. What were the results of the Paris experiment? Well you can look at them in great detail here, on Claudia Fritz's website. But here is what Fritz and Curtin spoke about in September: First, "the choices were highly individual," Fritz said. Six participants chose new violins, three chose old, and one waffled before choosing old. Despite many news media headlines emphasizing A Strad? Violinists Can't Tell as the conclusion, this wasn't the main focus of the study, Fritz said. Violinists were not asked to focus on discerning whether the instruments were old or new for most of the experiment; this task took place at the end of the experiment, when the violinists were given 30 seconds with each instrument to guess if it was old or new. The soloists did not guess better than chance-level. "We did that at the end because we wanted to focus on preference," Fritz said. Certainly, whether the violin was old or new was not obvious to the players in this context. At the end of the session, Cho-Liang Lin and pianist Rohan de Silva treated us to the "Blues" movement from Ravel's Sonata for Violin, played once on Lin's own 1715 "Titian" Strad, then on the new violin by Collin Gallahue that had just won a gold medal at the Violin Society of America's competition that week. Lin had chosen that violin from among a number of the winning violins: "I loved them all," Lin said. "I felt more comfortable, knowing how to produce the sound on this one," he said of Gallahue's violin. He attributed that comfort to the fact that it was based on a 1735 del Gésu model, so it felt similar to a violin that Lin owns and regularly plays on, a Zygmuntowicz based on the same model. Of course we in the audience didn't know which violin was which until afterwards; I had the impression that the second violin (which turns out to be the modern) sounded a little darker, but both performances sounded great and I would not have been able to guess which violin was the modern and which was the old Italian. The performance with Gallahue's violin had the added fun of a string breaking in the middle of all the strumming in that movement. Lin had to stop, run back and switch violins, then complete the piece. Thank goodness there was another fiddle waiting in the wings. Violinists can't tell a Strad from a new violin -- in a 30-second guessing game! October 22, 2014 at 01:42 PM · Great article, thanks! October 22, 2014 at 01:59 PM · Nice essay. If you can't pick out old vs. new with Philip Setzer playing them, then it's hopeless! October 22, 2014 at 06:40 PM · Actually, I think that the difference in violins would be more obvious in a lesser player than in one who has such a strong voice and is so good at producing it on any violin. October 23, 2014 at 11:08 AM · I had two experiences with being aware of a fiddle's age that I have posted before, but I think are relevant here. First was at Beare's. I was trying instruments and saw a gorgeous looking violin that I thought was probably an 18th Century Italian. I played it, and was surprised - I thought it felt and sounded new. I looked inside, saw a Peter Beare label with a recent date, and assumed it was a repair label, played again, looked again and realised it was a new instrument, and the label was the maker's label. They had an 1846 (I think) Georges Chanot del Gesu model and I tried that. It looked new - no wear on the varnish at all. I believe it had never been played before being in the shop. It also sounded "new". I don't believe you can always tell, but I think there are some extremes that stand out as "not having been played much"
I'm pretty much in agreement with points 2-4 (though with point 3 it can sometimes go one way or the other) but in complete dis-agreement with most of point #1, which is really 2 points. It is so obvious to fine players that violins change with use (note "change" - often but not always improving) that I feel like I'm being called on to defend the idea that the Earth is round. Based on my personal experience I would also say that Mr. Curtain's opinion is a minority one among makers, too. I own violins by Ed Maday and Vittorio Villa. Once, not long after getting a new violin from Ed, I brought it back for a check-up. Ed played a few notes on it and exclaimed "Man, you've been giving it a workout!" Vittorio wrote to me "It is you and other owners who have made my violins what they are today." The maker Zanri offered me a subsantial reduction in the price of his violin if I would give it a lot of playing before he submitted it to a VSA competition. Charles Rufino told me that he was amazed to hear one of his violins open up significantly right in front of him as someone put it through some breaking-in exercises.This leads me to another point: as to "the longer they are played, the more they will improve" I would say that there is more or less a ceiling. But there is no doubt that they react to HOW they are played, so yes, the BETTER they are played, the better the likely results. October 25, 2014 at 01:44 PM · One area seldom addressed: Each player has a concept of tone and tries to achieve that magical goal regardless of what instrument they are playing. That desired goal is easier to reach on some instruments...some, Never. Though my experience with great violins is limited, having played on teachers'/friends' Italian masters, Strads to me, have more "ropes" to learn than Guarneri's, before the desired tone quality if achieved. One more pertinent comment: My violin dealer keeps an absolutely miraculous bow in the try-room. This makes all his samples sounding worth the price.